Simon and Wildlife Aid's vet, Emma, were called to a very distressing rescue in Bookham. A vixen was badly injured; she had an open wound to her stomach. As she had previously been seen nursing several cubs, the situation was especially tricky. Simon caught her quickly and Emma examined her, but the prognosis wasn't good at all ... she had been disemboweled and her intestines were perforated beyond repair. Thankfully, they were able to put her to sleep before she suffered any further. 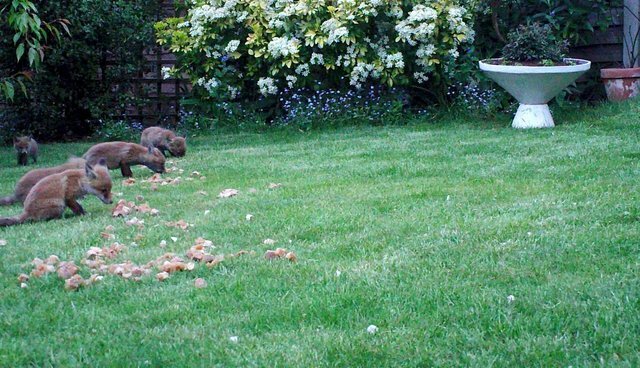 The kind homeowners agreed to help the now orphaned cubs, by feeding them over the course of several weeks. Simon put a trophy camera in the garden to monitor their progress. Many weeks later, the fox cubs were in superb condition, so we were successful in giving them a second chance.